Archos Arnova 7f G3 tablet review - today at For consumers blog we are going to take a closer look at one of the affordable Android 4.0 Ice Cream Sandwich tablet from manufacturer Archos. This is a slightly upgraded model from what we've seen in the Archos Arnova 7b G2. Archos Arnova 7f G3 is a slim 7-inch tablet with 1Ghz processor and 1GB of RAM. This smart combination between high performance hardware and intuitive software means that the ARNOVA 7f G3 gives an excellent tablet experience, whether it’s using the full web (with flash support), watching full HD2 videos or using the thousands of Android apps and games available to download. Archos Arnova 7f G3 is perfect for that on-the-go Android tablet experience, the crisp 7 inch, 800 x 480 pixel screen makes the ARNOVA 7f G3 great for using apps, browsing the web or watching videos. And the slim (10.85 mm) and compact body means that it’ll easily fit into your jeans or jacket pocket. The Arnova 7f G3 runs Android 4.0 ‘Ice Cream Sandwich’1, the mobile operating system designed by Google™. With a specially designed user-friendly tablet interface, perfect for internet and applications it includes Flash 11 support for a true web experience. Thanks to Android 4.0 Ice Cream Sandwich, multitasking has never been easier. Switching between your open apps at the flick of a finger and closing those you no longer need with a simple swipe. Thanks to the intelligent processing of Android and the powerful processer of your ARNOVA even with dozens of open web pages or flash videos, your ARNOVA 7f G3 can handle it with ease. Thanks to the advanced customization in Android, your ARNOVA 7f G3 can truly be your own; whether it is simply changing the wallpaper, setting up application folders or adding resizable home-screen widgets so that you can find the info you want without even needing to open an app. The Arnova 7f G3 includes a range of preinstalled applications selected by ARNOVA so you can start to use it straight out of the box. And with the AppsLib applications store you’ve also got access to thousands of free and paid-for applications available to download straight to your tablet. Whether it’s games, news, social networks or productivity tools there’s a whole world of apps open to you. And thanks to the AppsLib approved stamp, you can know which apps will work great on your tablet. Thanks to its powerful 1 GHz ARM A8 processor the ARNOVA 7f G3 is able to bring you great games and with its open GL 2.0 technology it can even play 3D games. With hundreds of games available to download from the Appslib applications store your ARNOVA 7f G3 can quite literally be your Android games console. Once connected to your WiFi network, the ARNOVA 7f G3 lets you manage your emails whenever you want. You can configure a variety of email accounts on the built in email tool, giving each member of the family quick and easy access to their own messages. Thanks to the range of document, slideshow and spreadsheet editors available to download on AppsLib4, you ARNOVA 7f G3 can be your mobile work station; you may never need your laptop ever again. With the integrated microSD card reader you can transfer files easily or even plug in a USB flash drive in the USB host slot / via the USB host cable. The ARNOVA 7f G3 is the perfectly product for browsing the web via the integrated 802.11 b/g/n WiFi. Thanks to the 800 x 480 pixel wide screen, there’s no need to zoom in and out as web pages will be displayed at their full width on the ARNOVA 7f G3. With Flash 11 support5 you can experience the full web with flash games and videos. Through the range social networking and chat applications you can stay in touch with your family and friends anytime and thanks to the integrated webcam, you can even use video chat. The powerful 1 GHz processor in the ARNOVA 7f G3 means that it can play HD video files up to 1080p7 smoothly, even in the widely-used H264 codec that most other tablets can’t handle. Most well-known file formats are supported whether it is video, audio or photos so you won’t need any conversion software. And it’s easy to transfer your files into the built-in or extended memory with simple drag and drop from a PC over the USB cable or use the pre-installed file manager to transfer them from a USB flash drive. Your ARNOVA will recognise the new files within seconds and put them in your media library. Sharing your videos is easy with the large 800x480 pixel screen so that everyone can enjoy and thanks to the integrated speakers your tablet is a perfect portable HD media player or you can plug in any standard headphones in the 3.5mm jack for a bit more privacy. ARNOVA 7f G3 is compatible with all the major formats and codecs for music and video, manages meta data for your music library and has cover display so you can find the album you want even faster. Because it’s Android you can play music in the background whilst using other apps and there’s even music download and streaming applications available to download to take your music experience even further. 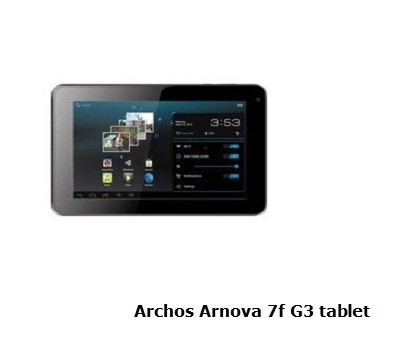 The price for the Archos Arnova 7f G3 tablet varies around £80-100 (in UK). I have tried to use the USB slot so host a flash drive as claimed, and it does not work. I would love to know how??? same here ... any solution?? i have the same problem too, plus the battery gets low quickly and the charging ports is not good..